WHCP’s Beatin’ the Blues Fundraiser! Beat the Blues!! 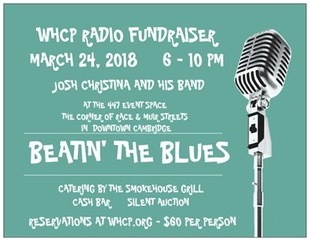 March 24, 2018 – it’s the fourth annual WHCP Fundraiser, at the Event Space at 447 Race Street starting at 6:00 p.m.
Join us for a full barbecue dinner catered by Smokehouse Grill, live music by rockabilly star Josh Christina and his band, WHCP’s famous silent auction, and lots of fun! Tickets are $60 per person and available at WHCP.org or you can mail us a check to the WHCP studios at 516 Race St., Cambridge 21613 (make sure to tell us you’re buying fundraiser tickets). We hope to see you at our Beatin’ the Blues fundraiser this year! It’ll be fun! Please select the number of tickets you would like to purchase, then click the Add to Cart button to proceed.